BATON ROUGE, La. 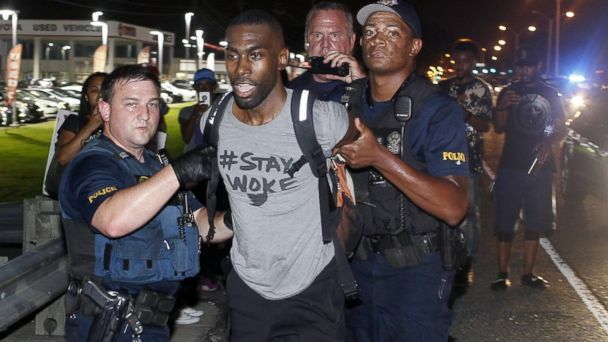 -- Prominent Black Lives Matter activist DeRay Mckesson has been released from jail after being arrested during a protest in Baton Rouge, Louisiana, according to officials. An Associated Press reporter saw Mckesson leave the East Baton Rouge Parish jail on Sunday afternoon. Mckesson was among about 130 people taken into custody in Louisiana over the past two days after protests over the fatal shooting of an African-American man by two white police officers in Baton Rouge on Tuesday. Mckesson says that he "was disappointed in the Baton Rouge police, who continue to provoke protesters for peacefully protesting. There's a lot of work to be done." Mckesson gained a national following after he left his then-home of Minneapolis in August 2014 for Ferguson, Missouri, to document the police shooting of Michael Brown. Click here for full coverage on the deadly Dallas police officer shootings.